Many people around the world have medical conditions that prevent them from doing certain things. Many people have spoken about living with a condition, but never really the anxiety that comes with it. I have epilepsy, which is a neurological disorder triggered by episodes of sensory disturbance, loss of consciousness, or convulsions, associated with abnormal electrical activity in the brain. I was diagnosed with it when I was just four years old, and although it hasn’t stopped me from doing a lot – I can still walk, dress myself, go swimming – it has prevented me from doing things like drinking, driving, and doing things alone. At that age, I was oblivious to it, so it didn’t really affect me until I was more aware of myself, at around six. I never used to be able to feel my fits, until I was 16. You’re conscious you’re having one, but there’s nothing you can do about it. You can feel your eyes rolling back, your body shaking, but all signals to your brain are cut like you’re just in limbo. It’s a very strange sensation and not nice – very uncomfortable. It’s been hard for me living with epilepsy; I was just turning 17 and my anxiety about having a fit when I was going out, or being too far from someone who knows how to look after me, shot through the roof. I wouldn’t leave my dad. I play for a local football team and wouldn’t play the away games because travelling was too much. I’d have panic attacks and couldn’t sleep. I can’t put into words the sheer amount of fear I had knowing that any minute I could have a fit and there’s nothing I could do about it. After having a fit in the shower, I’m now too anxious to lock the door. I don’t like being home alone anymore, and even a simple walk to the shops can be scary. I lie in bed trying to sleep, but worry about what will happen if my dad doesn’t hear me having a fit. What if I fall, bang my head, or stumble into the road? There are so many “what ifs”, but these are all present problems for me. I also have the problem of not being able to drive – what if I never can? I’m 22 and have never been clubbing because the lights could trigger a fit; will I ever get to experience that? So many “what ifs” tick over in your brain, making you more stressed and anxious, making you feel not worthy or that it’s pointless to continue. My epilepsy has affected my work massively as well. Added to the fact I’m not able to drive to work, and being away from family and using public transport terrifies me, I’m limited in what I can do because I can only work certain hours – the medication I’m on has side effects including drowsiness, so a day’s work feels like two for me. I can hold a job down for about three to six months and then my seizures become more frequent. During school, I used to get bullied when I had seizures in class, which made me anxious about going to school. It wasn’t just because of the seizure itself, but everything that came after it – the name calling, and the fact it’s hard to make friends when you’re someone who doesn’t really like doing a lot. And then I had a daughter, and as all new parents know, this is a whole different ball game. I was so anxious; I didn’t know if I’d be able to cope with her, let alone with my condition, too. But I took it slow and I eased myself into it. My parents helped and taught me a lot, and now she’s three-years-old and I’m more than confident to have her on my own. I’ve learnt that you need to take care of yourself first in order to take care of others. Even though that sounds selfish, think of it like this: if someone was drowning and needed aid like a lifebuoy and you jumped in without one, then there are two drowning people. You have to make sure you’re equipped before you can help others, and that’s exactly what I did with my little girl. I’ve never really found a coping method for my epilepsy other than to sleep a lot. I try to keep my mind busy but clear. I’ve found its best for me to be relaxed, close to home, and to get as much rest as I possibly can. Epilepsy has also brought me some sort of depression. I can’t do some things like drive, drink alcohol, stay up late, enjoy music festivals, or travel and it hurts when I see my friends posting pictures where they’re having such a good time, while I’m sitting inside my bedroom watching the world go by. It is tough, and another effect has been memory loss. I have a terrible memory, to the point I probably won’t remember writing this article in a few days, despite spending so long doing it. I can’t remember any of my childhood, which really upsets me. Those friends who I don’t see regularly I completely forget. There are parts of my daughter’s upbringing I can’t remember at all. I have found a coping method in photography though, which I love. When I take pictures, I remember the days much more clearly, so the hobby has such a personal meaning to me. Despite all this, I definitely feel like I’ve managed my epilepsy really well. I still do a lot of outdoor activities that are like extreme sports. I don’t let it stop me from working or going out, I just require some more attention or more time to get over these events, but I’m definitely looking at it positively and hoping everything bodes well for the future. Sam’s experience brings home the importance of finding your own way to look after yourself. We are all unique and one size doesn’t fit all. Trial and error to work out what helps is important in finding the self-care combinations that maximise wellbeing. 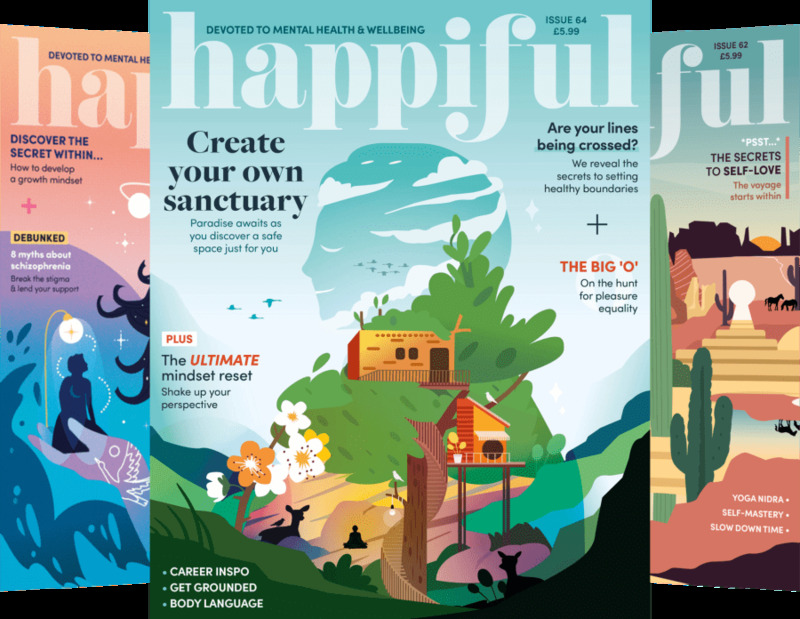 Sam is a contributor to the January issue of Happiful.